Glitz Design: Get Your Glitz One Challenge #2 Winners!!! Get Your Glitz One Challenge #2 Winners!!! Can you believe that a month has past already, and it is time to name the winners of the "Get Your Glitz On" May Challenge: Clustering Top 5?!! We had an awesome number of participants this month, and loved seeing your take on the technique of clustering!! 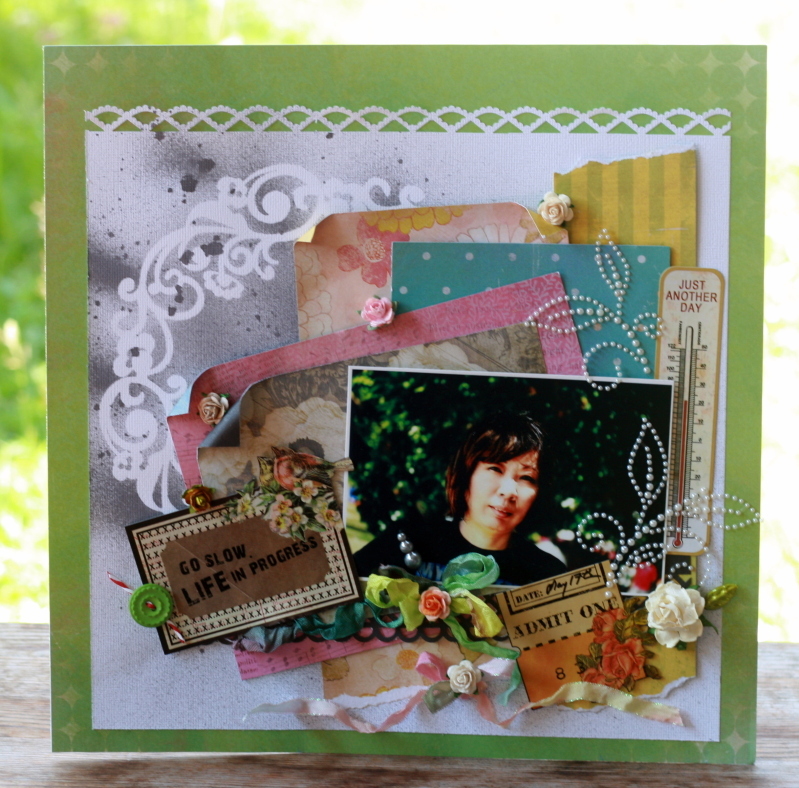 Shona did a beautiful job clustering all of those gorgeous flowers around her photo!! And I just love the artistic feel of the misting she did with those botanical silhouettes...and the sweet little cluster she created with the title sticker. Amazing job, Shona!! Please email your mailing address to glitzdt@gmail.com. And here are the rest of your Top 5 entries!! How gorgeous are all the different flowers Romy has clustered together around the corner of her photo?!! I love that she cut some flowers from patterned paper, used some transparent flowers from our awesome Peek A Boo packs, and she included more dimensional paper flowers!! 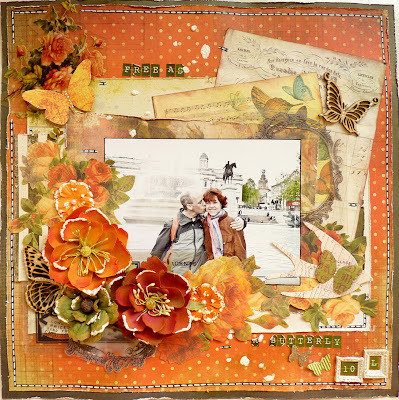 I also love how she layered the Paper Layers in the background...such an awesome display of Glitzy goodness!! Fabulous job, Romy!! I love the soft and vintage feel of this card...the beautiful cardstock sticker is just perfect with that little cluster of flowers and the beautiful tulle trim Betik has used!! And I just love the sugared effect on the very tips of each flower petal...such a gorgeous touch!! Beautiful card, Betik!! I just love how Sherry's cluster of embellishments is a little scattered, versus them all being tightly embellished together. You can still tell that she has done a beautiful job of clustering, and the added space between each item just gives it a bit of whimsy! And what isn't to love about how she used those amazing doilies?!! Love it!! (And by the way- she also made the resin flowers. Be sure to check out her blog for a tutorial!!) Awesome job, Sherry! 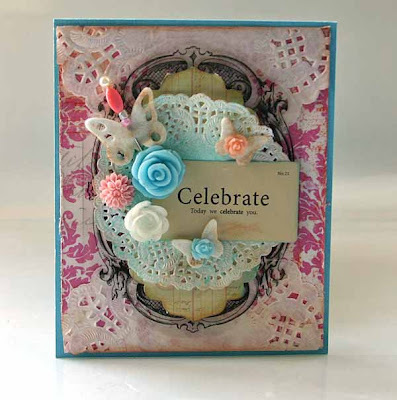 I just love how Pearl has used all three of the latest Glitz Design collections on her layout, and it all looks so fabulous together!! She did an amazing job mixing and matching them all! And I just love her sweet clusters of crinkled ribbon, teeny flowers, and pearl flourishes...they just look amazing!! Wonderful job, Pearl!! Thank you to everyone that participated in the challenge this month!! You all did a wonderful job, and I loved checking out each and every project!! The next Glitz challenge will be posted later on today, and we hope that you will join us once again!! I am super excited about the challenge this month, and I am sure you will be too! So come on back over a little bit later!! Gorgeous designs! Congrats to Shona on winning! Congratulations to Shona and the top five!!!! Absolutely amazing creations! Woo Hoo girls! Wonderful job - congrats all u girls especially my friend Pearl!! wow~~ outstanding entries and clear to see why they were chosen. SO lovely to see some familiar names there! :o)Way to go girls. Beautiful creations everyone!!! Congratulations to Shona! The new sketch that is up is amazing!!! Congratulations everyone! Congrats Shona on winning this challenge! Big congrats to Shona and all these other winners! WTG! Congrats Ladies!! Love all beautiful creations! Beautiful work Ladies! Great job and congratulations! Congrats to Shona and everyone in the top 5 mention!! !